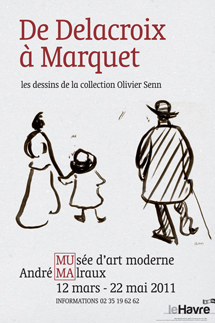 "De Delacroix à Marquet", the third and final exhibition on Olivier Senn's collection of prints and drawings, pays tribute to the works of other artists acquired by the collector, namely Boudin, Guillaumin and Marquet, but also Delacroix, Whistler and Gonzales, among others. A great admirer of Boudin, who died when he began his collection, Olivier Senn acquired a number of works by the "father of Impressionism". The exhibition presents 17 cloud studies painted outdoors, as well as a set of watercolours produced around 1865 on the beaches of Normandy. Light and delicate, they depict the society life that was developing on the coasts of Normandy at the very moment the trend of bathing in the sea, come from England, was enjoying tremendous success. Close friends with Armand Guillaumin and Albert Marquet, Senn was an ardent collector of the latter's coloured pastels and the former's washes performed in quick brushstrokes. Guillaumin, the most discreet of the Impressionists, is represented with warm and highly spirited artworks: from the hilly landscapes of the Creuse to the jagged Estérel coastline and the Isère plains, as well as stunning portraits that capture the intimacy of day-to-day life. Marquet's ink drawings, with typically Japanese economy of means, sweep us up into the whirlwind of Parisian life in the 1900s. With a few strokes of the brush or pen, Marquet sketches figures, horses and carts, which he later introduces back into his paintings. These furtive silhouettes are displayed opposite a selection of Marquet's Parisian paintings from public and private collections.